I’m at that age when many of my friends are having kids. I’ve never wanted to be a mom, but I am excited to be an Aunt. It’s important to have kids in my life – youth keeps us young – and so I’m trying to be a good “Aunt Mo” to my friends’ kids. I want to be the kooky awesome aunt who takes them hiking and camping and teaches them how to build a fire, catch salamanders and communicate with dogs. Last week, I took a mini road trip through rural eastern Virginia to visit my dear friend Mego in Virginia Beach. Meg and I met on the soccer bus in high school and we’ve been friends now for more than half our lives. In many of the ways that count, we couldn’t be more different: Meg is a devoted Navy wife, a mom and a politically conservative Christian and I’m a liberal gypsy Darwinist, but we share deep roots and an abiding mutual respect. I’m lucky to have such a close alliance with somebody whose life is governed by a completely different set of beliefs and priorities and I think Meg feels the same way. Last time I saw Baby P, he was standing on his own, but not yet walking. Now he’s toddling all over the place! 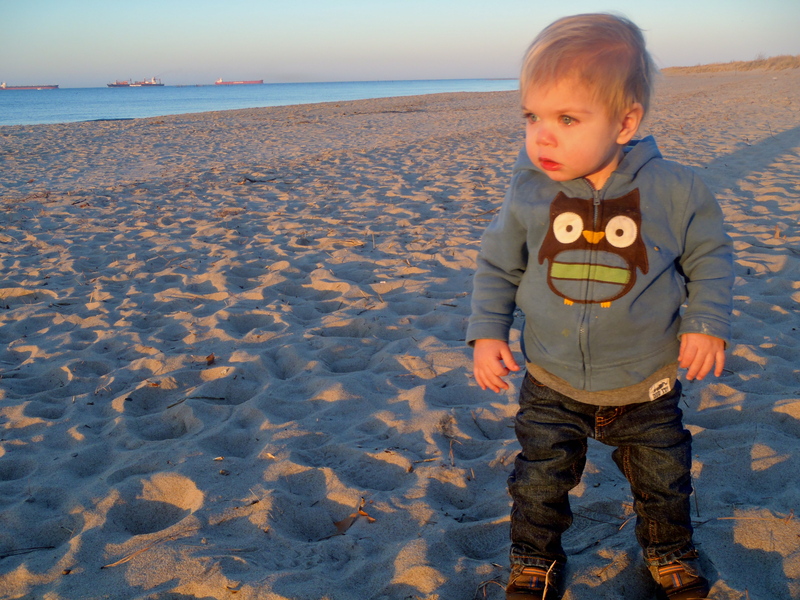 As a Navy baby, P has grown up on the coast, but this trip to First Landing State Park was his first time walking on sand. The kid didn’t quite know what to make of it at first, but once we got him moving towards the water, he didn’t want to stop. Meg scooped him up before he marched right into the waves. Fearless, this one. He’s not camera shy either. People who don’t want to have kids often say they “don’t get it”. I am not one of those people. I do get it. Watching P learn to navigate new terrain and marvel over every little thing in his path was fascinating and refreshing. For about 24 hours. By day two, I was more than ready to get back in my car, roll down the windows, crank the music and drive home to my furry kids. To each her own and may we all prosper! 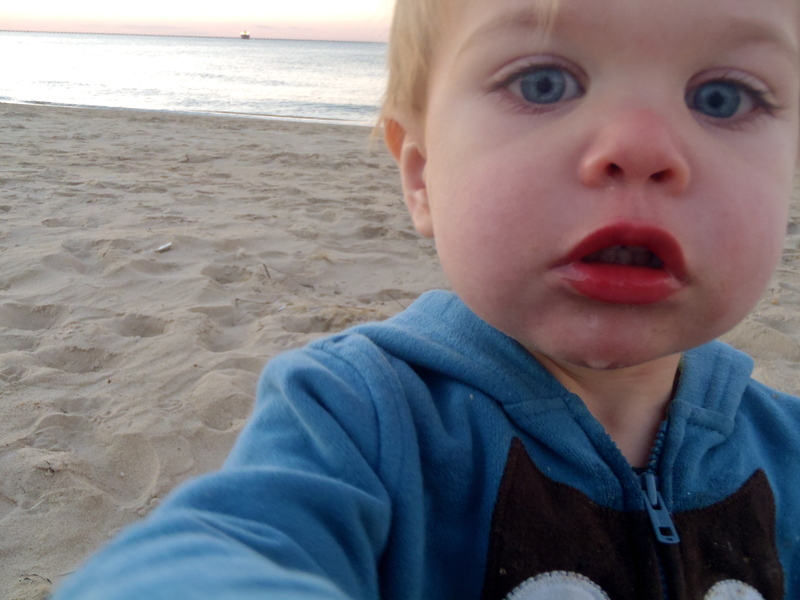 Check out my last Friends With Kids post: Babes in the Woods. 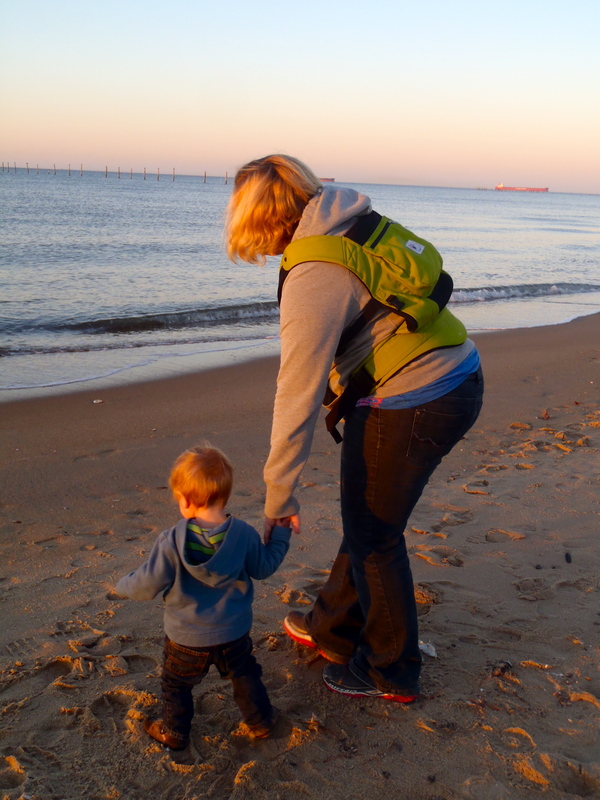 3 women, 2 babies, 7 dogs, 5 miles… now that’s an adventure! 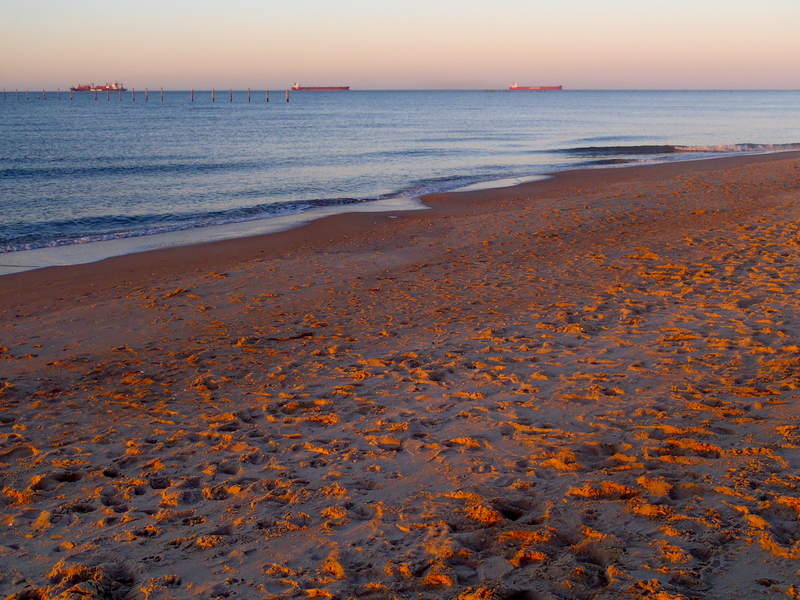 This entry was posted in Bowie & D.O.G., Photography, Uncategorized, Vagabonding 101 and tagged jellyfish, sunset, Virginia Beach. Bookmark the permalink. Just being there as an auntie and making memories, like this, is the best thing you can do for this little one. He’ll grow up knowing more than just his immediate family loves him and is looking out for him. That’s a wonderful gift to give. Thanks, Kat. 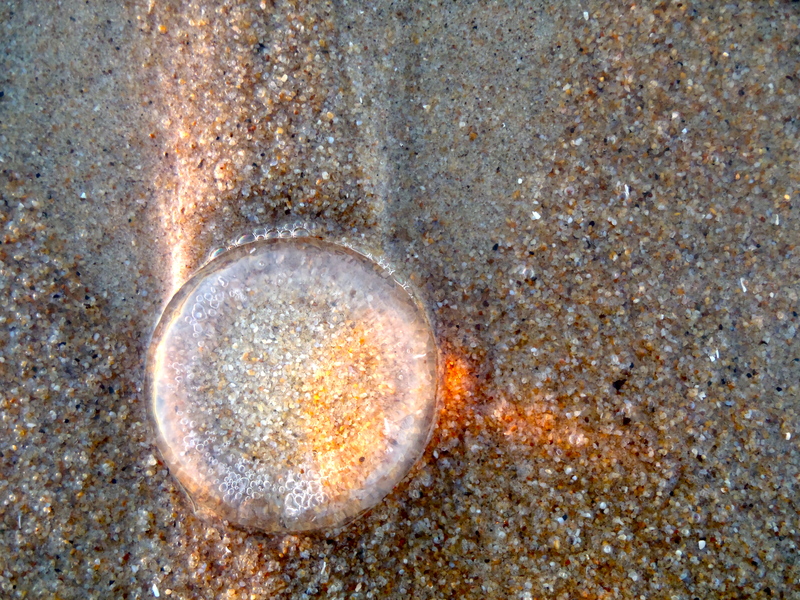 I was totally geeking out over that jellyfish. Wayyyy too many photos! Agree with forkinriver – absolutely – sure you’ll be a wonderful aunt , as you are a wonderful blogger – like the references to hikng and lighting fires, everybody needs a bit of that. Oh and as usual – great photos! Thank you for this beautiful post! What a boring world this would be if we were all the same! I just love your perspective on friendship and faith. I have people in my life with opposite paths and they just enrich it and I love them for it. Lovely. Your influence will be ever so important on those youngsters you spend time with. It is wonderful that you are being true to yourself in your decisions. That is the way it should be. Had I been really true to myself, I probably would not have gotten married and had kids – at least not at such a young age as I did. That being said, I do love my kids and enjoy their friendship as the adults they have become. Baby P is adorbs!!! And yay to those furry kids!!!!! Love ’em!!! Isn’t he? Quite the charmer. You were in my neighborhood! I walk the beach, a few miles from where you were, several times a week with my dogs. And just last week we went to First Landing, but at the other end of the park.